Moving home is stressful at the best of times, but moving to another country can be a much more daunting prospect. There is so much more to think and to worry about. No matter how convinced you are that you are doing the right thing there is always that element of doubt. One of the main concerns is “how will the children cope?” Children are far more resilient than we parents sometimes give them credit for and the odds are that they will settle in a lot more quickly than the adults will. But there are ways of helping them get this initial period in your new country off to a positive start. When faced with a move abroad, children can feel overwhelmed and cut off from the decision making process. Inviting your child to help make decisions whenever they can will help them feel involved in the move and give them ownership of the changes they are faced with. They may not be able to have a say in which country you a moving to or where you are going to live, but they can make smaller decisions. Why not ask them to choose which bedroom they will have, which clubs they will join or which new places you will visit during your free time. Even at a reasonably tender age, this will give them a feeling of importance and inclusivity and get them on board at a fairly early stage. When it comes to preparing a child for a move abroad, knowledge is power. Get online with them to find out as much as possible about your destination. Finding out all about the country will build their excitement about the move and help them feel familiar with their new home. You and your son or daughter could make a scrapbook together, all about the country you are moving to. What are the local landmarks, attractions and festivals? Where is your new street? Where is their school? Are there any interesting traditions or customs specific to that city or country? There are endless questions to explore and answer. Your removals company may be able to provide you with some support or resources to help with this. Running through exactly what will happen before, during and after traveling overseas will ease your child’s anxiety and take the fear out of the move. They will have endless questions about how you will get there, what you can pack, where you’re going to live and where they’re going to school. Taking time to answer these questions will help young ones feel more secure and confident about the move. Taking time to prepare for the move and say goodbye to the people and places that are important to your offspring is a key part of the moving process. Your child needs to understand and accept that they will be leaving some things behind when they move and saying goodbye is an important part of this. As well as ensuring your child has plenty of quality time with close family and friends before leaving, why not let your children plan a leaving party to say goodbye in a positive, happy way? Play games relating to your move; have a quiz about your destination country or ask friends to write messages or advice to pack away in a special keepsake box. You could even use the country you are moving to as inspiration for the party food and decorations. The majority of children will compromise on what they will take with them so that you don’t end up shipping rubbish. Either persuasion or bribery can normally achieve this! If there is more than one child involved then sometimes you may have to limit the number of boxes each can have to ship their goods. Have a meeting (remember the involvement factor) and set on agreed number of cartons. 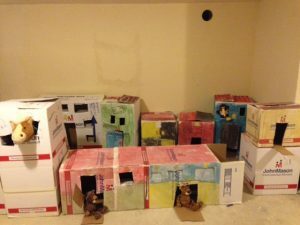 Ensure that each child gets the same number of boxes to prevent the outbreak of civil war. Ask your mover at the time of the survey if you can have the boxes beforehand so that they can have a sort out. Children will understand when they see that you are leaving things behind and they will normally want to make a contribution. There is also the prospect of replacing old toys with NEW ONES. This is where bribery comes in! Why not let them sell their unwanted items and be allowed to keep the proceeds to buy new ones on their arrival. This also saves you some money. Electrical items from bedrooms can be a good idea to take. Stereos, computers and Playstations should work in New Zealand and Australia. Although some televisions, videos and DVD players do not work properly in these countries they may be worth taking because the TV can act as a monitor to play the Playstation on or to watch UK DVDs. When you arrive, your children will almost certainly be tired and a little overwhelmed by the journey. However tempting it may be to dive straight into unpacking pots and pans or exploring your new town or city, getting your child’s room set up and ready should be a priority. Filling their room with old, treasured items such as their favo urite bedclothes and stuffed toys will create a sanctuary of familiarity in a world of change and excitement. You will inevitably need a few new things, but involving your child in choosing and purchasing these items will remind them that the room is still very much ‘theirs’. While change and progress is stimulating and exhilarating, children also need a degree of stability and it’s important to give them somewhere that feels immediately like home. One of the most nerve-racking parts of any child’s move abroad is starting a new school. New teachers, making friends and finding their way around can fill any child with dread. Easing their concerns and ensuring they set off on the right foot is essential. Before they start, speak to their teachers about any specific worries and help them get to know your son or daughter’s particular interests or hobbies. They can then help your child mix with others with similar likes and dislikes and, if your child is feeling particularly anxious, the teacher can then introduce a favourite toy, game or subject to help them feel calm and relaxed. On their first day, ask if your child can introduce themselves to their new classmates. Give them the opportunity to tell them all about them, their family, their favourite things and where they moved from. Their new friends natural curiosity will have them bombarding your child with questions and your home country and unique background in no time at all. Moving overseas can leave you and your children feeling a little lonely and isolated. Take the initiative and seek out new friends, particularly those with children a similar age to your own. Knock on your neighbour’s door and introduce yourself, invite colleagues over for a bbq, embrace every opportunity to meet new people. Encouraging your child to play with others in the safe, secure environment of your home will allow new friendships to blossom. Making friends will, in turn, help you and your children to lay down roots and feel at home in your new country. While you may be looking to the exciting changes ahead, children will still crave routine and familiarity. After you move, try to keep certain habits and customs as they were to give your child some security and comfort. If you always read a story before bed, watched a movie together on Friday or had a family dinner on Sunday, keep doing it. Eventually you will create new family traditions in your new home, but try to keep the important parts of your child’s schedule the same. It is important that children understand that friends and family back home will remain an important part of their lives. This is an import one of our tips for moving abroad with children. While they are moving forward and making new friends, keeping in touch is a great way of easing the transition. Arrange regular voice or video calls with best friends, grandparents, cousins and anyone who formed an important part of their lives. For older children, social media can be a great way of keeping in touch, although too much time looking at pictures and posts from friends can lead to homesickness and stop them engaging with their new social life abroad.